In the previous article, we told about teachers who came from southern Norway and the problems that arose when trying to teach in an area where they were familiar with neither the culture nor the language. We shall now continue with other accounts that show, in particular, their encounter with the Sami language. Some of them learnt Sami well, others never learnt. 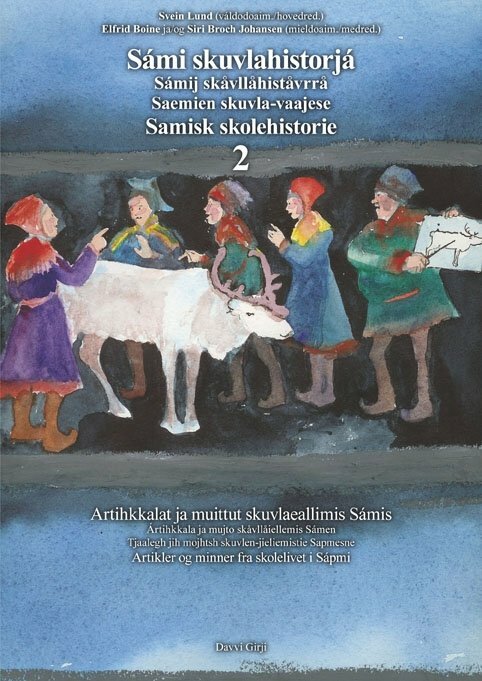 Even today, one hears that the reason that pupils weren’t taught in their mother-tongue is that there weren’t enough teachers who spoke Sami. 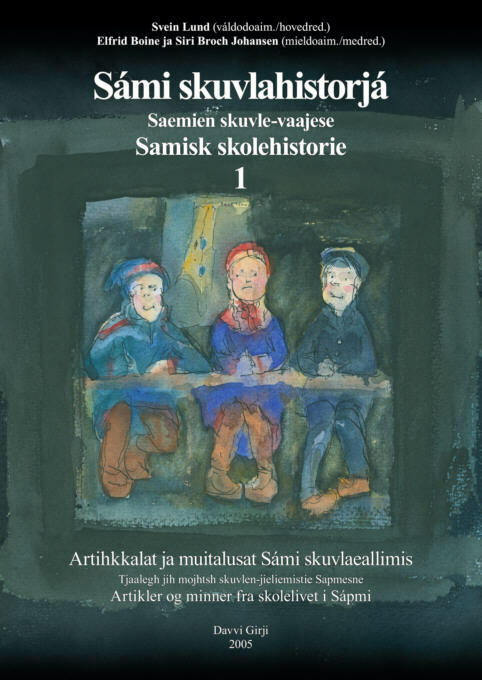 But many stories we have found show that the school authorities preferred teachers who didn’t speak Sami and neither did they want the Norwegian teachers to learn Sami. The teacher telling his story here, Leif Sletsjøe, was a teacher in Karlebotn, Nesseby for six months in 1946, before moving south again, where he later became a professor at the University in Oslo. 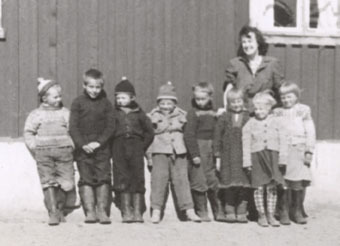 “When I reported on New Year ’s Eve 1945, to travel to Finnmark as a teacher, I knew nothing about where I would end up. I left for the north without knowing anything about the conditions I was going to be living under and I was also completely ignorant about which school I was to be employed at. I ended up at a school in an almost exclusively Sami district, Karlebotn in the municipality of Nesseby, where I worked for 5 months. “- After secondary school, I wanted to go on to further education, but there wasn’t much support for this in my local environment. Despite this, I went off to Oslo where I completed sixth-for college. After sixth-form, I applied to teacher-training college but was not accepted because I was too young. On the other hand, I got a job as a replacement teacher in Finnmark. It was a shock. Nobody had told me that I might encounter pupils who spoke something other than Norwegian. But it turned out that a large part of the pupils were Sami-speaking and their knowledge of Norwegian was very limited. I have since often wondered if they learnt anything at all from me during the year I was there. That year made an enormous impression. I realised that something was terribly wrong, when a person could take artium [Eksamen artium = A-level exam from 6th-form college. The expression artium ceased to be used following the introduction of the Further Education Act in 1976] in Norway without hearing there were countrymen who spoke other languages than Norwegian. After a year as a replacement teacher, Randi left for teacher-training college in Levanger. Her experiences from Finnmark led to her writing her educational-science dissertation on the teaching of Sami pupils. She has kept the dissertation, which we are allowed to see when we come to pay her a visit in Hønefoss. Considering that is was written in the early 1950s, it is an impressive piece of work, holding clearly to account the Norwegianization policy that was dominant at the time and which she herself had helped to implement in school. As part of the dissertation, compares the reading-speed of pupils from schools in the interior of Finnmark with that of pupils in Trøndelag. That was what people thought at the time, she says now. – With what we now know about reading and understanding, one would have to say that this didn’t give a proper picture. It wasn’t the reading speed, but rather the understanding that should have been measured. 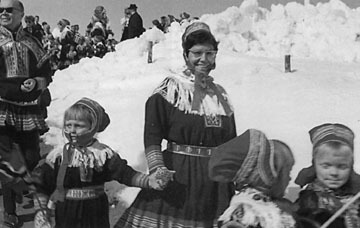 After teacher-training college, she returned to Finnmark and was, for many years, a teacher in Karasjok. Later, she became director of schools in Finnmark and advisor on Sami affairs in the Ministry of Education. Marit Aubert med 1. klasse. So, we have been running the school for 14 days already. The children are more or less as in the south, we think, and the ones we have now are nice and pleasant. 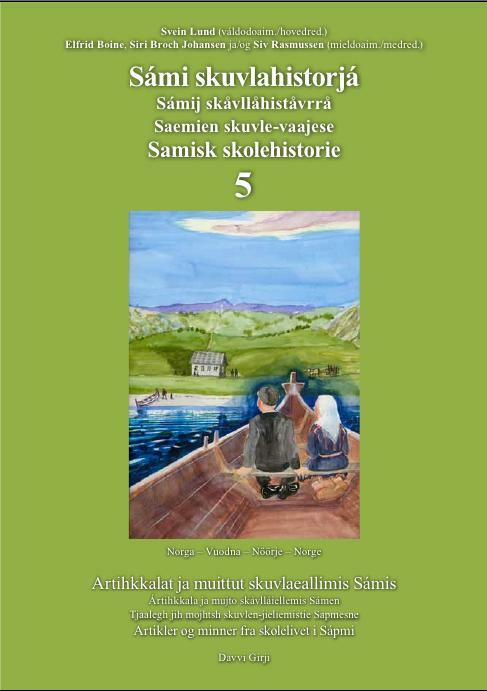 But - there is no doubt that the children should have learned Sami in the school, at least for the first three years. It is rather sad when you think about that only one of ten pupils find any pleasure in listening to the fairytales we read for them. It is just as difficult with religion as with fairytales. Most of the time we work with Norwegian and Math, but 5 hours a day is a lot for the little ones, they get disheartened by the end of the day, restless too. We have now entered the last week with the little ones. Sadly they have not learned much. The language is the barrier. We did not learn much Sami ourselves either, we somehow fall between two stools when we have to teach the children Norwegian. 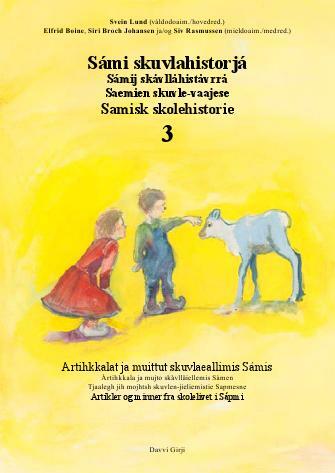 Next year a Sami ABC will be published, it will be exciting, maybe we can learn also together with the pupils. Even though most of the teachers returned south with little knowledge of Sami, there were some who really learnt – and stayed, and used Sami in school. Among them, Inger Seierstad, who came from Oslo to Guovdageaidnu in 1953 and still lives there. "I came from Oslo to Kautokeino just after finishing upper secondary school and school of domestic economics in 1953. We were five teachers with no teaching education, the youngest was 17 years old. That was Ole K. Sara, who was a substitute for a short time. Four of us were below the age of 21 and didn't have suffrage. Ole was the only one who spoke Sami. The educated teachers at our school were Ola Aarseth, Alfred Larsen and Anders Bongo. All of them spoke Sami. Right away I understood the necessity of trying to learn Sami in order to function as a teacher. Many of the pupils didn't know much Norwegian. I never heard that it was forbidden to speak Sami in school, and was quite surprised when I learned that many, many years later. I've asked other Norwegian speaking teachers who have been in Kautokeino, and they all say the same. My first teachers were my pupils. In the announcement for the job I applied for, it was told that one was obliged to attend a Sami language course. I asked for this course and the answer I got was that the announcement was to be understood in this way: If there was a Sami course, you were obliged to attend, and if you demanded it, they could start a course. An arrangement was made, and the parish pastor Jan Harr did a course for us three Norwegian speakers. Back then, as now, the priests were required to learn some Sami when they got an office in a Sami district. We learned some grammar and necessarily a few words in the process. We also got a crash course in cursing, so we could tell when the children were using foul language. My best teachers were my Sami friends. I learned while we cut shoe grass (Carex), did handicrafts, sang hymns together, went fishing and drove with reindeers." Inger Seierstad with her pupils celebrating the Norwegian national day, 17th of May. 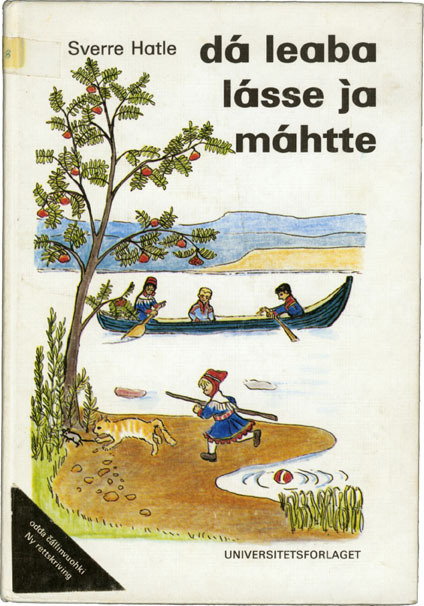 (Source: Muitalusat ja dáhpáhusat Guovdageainnus 10) "dá leaba lásse ja máhtte" was one of the books which Sverre Hatle made for elementary education through Sami language. Here is a newer version in the current orthography. - Dares to speak Sami even though he can’t! Though there aren’t many such examples, there were also some teachers who tried to learn Sami before they came north. 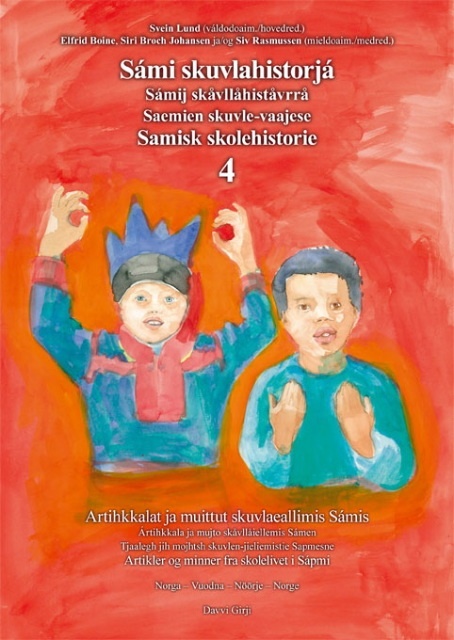 One of them was Sverre Hatle, who is also the only one of the teachers quoted in this article, who has, himself written down his story in Sami. He came from west Norway to Porsanger in 1966, and returned south in 1974. I found it important to know the mother tongue of the children to be able to do a good job. Therefore I tried to learn a little Sami on my own while attending the teacher's college in Volda. But I only had written sources at hand. To prove that I knew some Sami I wrote the application to the school board in Porsanger parallel in both Norwegian and Sami. It created more stir than I had reckoned, so the rumour went ahead of me to Skoganvarre: A teacher who was a southerner and spoke Sami was about to come. We were some acquaintances who were sitting and talking together, partly in Sami and partly in Norwegian, when my good friend, who considered himself as Norwegian speaking, blurted out: "I know Sami. I understand everything. But I don't dare to speak. But Sverre Hatle, he dares to speak Sami, although he can't!"